Mexico, Guatemala and the West Indies. 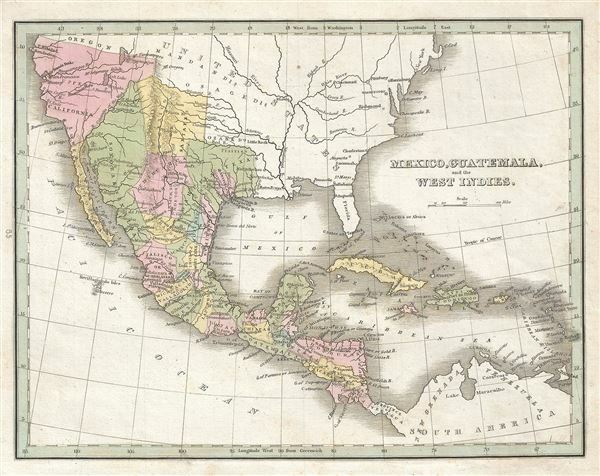 This beautiful map of Mexico, Guatemala and the West Indies was printed in 1835 by the important American mapmaker T. G. Bradford. It covers from Upper California and New Albion south to Panama, including the modern day regions of California, New Mexico, Arizona, Colorado, Utah, Nevada, Texas, Guatemala, Honduras, Nicaragua, El Salvador, Costa Rica and Mexico. Bradford's map offers an interesting pre-Republic mapping of state of Coahuila and Texas. Austin's Colony is the only Texas land grant identified. Further west this map really gets interesting with the mappings of Escalante and Humboldt very much in evidence. Bradford curiously charts two lakes in the Great Basin, one labeled Timpanagos and another smaller lake further south labeled Salt Lake. He is following Escalante's discoveries as recorded on the Miera map. The Escalante expedition actually visited Utah Lake (identified here as Salt Lake), but only heard about the Great Salt Lake from local Native American Ute tribe. Miera, Escalante's cartographer, thus mapped Timpanagos as much larger than the unseen 'Great Salt Lake.' The curious settlement of Brigsda is also noted just south of Lake Utah. Bradford also maps the apocryphal Buenaventura River running from the Rocky Mountains westward through 'Salt Lake' and westward to San Francisco Bay. The Buenaventura is the last incarnation of the apocryphal River of the West, a long sought after speculative alternative to the Northwest Passage. The mapping of Buenaventura here again references legitimate discoveries by Escalante of the White River and the Sevier River. In this case, both are mistakenly associated with the River of the West and given an erroneous outlet into San Francisco Bay. Towns, rivers, mountains and various other important topographical details are noted. Elevation throughout is rendered by hachure and political and regional territories are color coded. This map was published as plate no. 65 in Thomas G. Bradford's 1835 Comprehensive Atlas Geographical, Historical and Commercial. Bradford's atlas, published in 1835 was an important work on many levels. First, it was one of the first American atlases to follow an encyclopedic format, offering readers extensive geographical and statistical tables to supplement the maps themselves. Second, it was published in Boston and influenced the city's rise as a publishing center later in the 19th century (at the time most publishing in the United States was restricted to New York and Philadelphia). Third, this atlas was the first to contain a separate and specific map showing the Republic of Texas. Fourth and finally, Bradford's atlas in some instances broke the Euro-centric mold regarding atlas production. Among other things, Bradford focused his atlas on the Americas and abandoned the classical decoration common in European atlases in favor of a more informational and inherently American approach.